Product Round-up Budget PMPs are the missing link between a high-end video job and a standard MP3 player. With modern devices so advanced, some would class these PMPs as cell-phones without the option to call, a view I generally shared. However, without the distraction of ringtones and txt msgs, they have space to focus on getting the rest right and your phone doesn't suffer from a low battery life. Here, in alphabetical order, is a selection of what's available for less than £150 from each end of the spectrum. Apple, the Uncle Sam of portable entertainment, disappoints with its sixth-gen Nano that taints the addition of a touchscreen by removing all things video. Watching clips on its now 240 x 240 screen is an unattractive prospect anyway, but for that price, surely it's a mandatory inclusion? The camera has vanished too, so the addition of an FM radio aside, the Nano has limited options and feels more like a Shuffle with a screen than a thumb-sized Touch. The slick metal casing gives the Nano a sense of durability, but products this small are usually lost before they break. If competitively priced among some of the lower-end PMPs, the Nano would fare better, rated on its design and sound quality. But at £138, it’s poor value for money. While Apple will bring the new touchscreen and dimension reduction to its defence, the fact is, unless size matters, your money is better spent elsewhere. 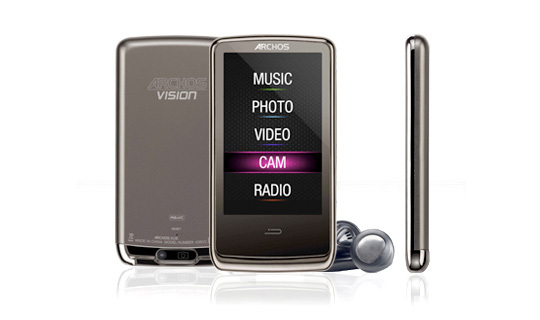 After my disappointment with the Archos 18 vision MP3 player, it was nice to see the French company drive some va-va-voom into products higher up the line. The 3cam Vision impresses from go with a smooth design and responsive touchscreen. Audio is booming enough for me, but perhaps too warm and its frequency range feels smelted. I was pleasantly surprised by the 3cam’s wide format support, which worked a treat when it came to video. The 3in, 400 x 240 screen is worth a watch. The 3cam has a built-in camera for photos and video, although the quality is a little grainy and it's situated in an awkward place, exactly where you’d naturally grip the device. The 3cam also comes with a built-in FM transmitter to wirelessly stream music collections. The Archos is let down by occasional loading errors, dodgy file browsing and no card expansion, but overall it still gets a tres bien from me.